Dignity, respect, independence, and choice. These are the hallmarks of Robert and Mary’s Place. There are a few key concepts that help shape what we do during the day. One of the most important relationships in life is interactions with people with whom one is comfortable. 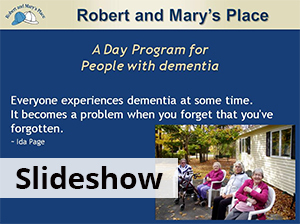 Conversation, laughter and sharing are components of socialization and are even more important to the elderly with memory loss. increase muscle tone,improve balance,improve physical well-being, andincrease flexibility. 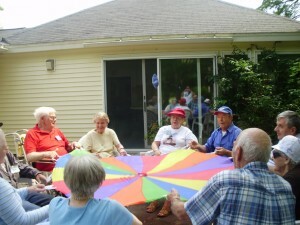 A variety of games and activities are part of the program and encourage interaction and cooperation between the friends. Sing-a-longs are one of the favorite activities. Other activities might include things like: arts & crafts, making gifts for their family, walks, visiting musicians and artists, and socialization. Friends are given choices throughout the day and we respect their choice to not do what we’ve planned. The schedule is quickly altered if our Friends are not engaged. Friends are free to leave an activity and enjoy a walk outdoors accompanied by a staff member or nap in one of numerous loungers if they choose. 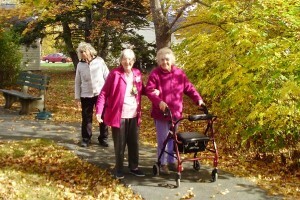 By respecting our Friends and giving them independence of movement and choices throughout the day we give them dignity. 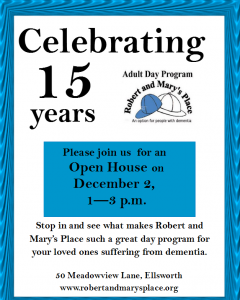 We encourage you to call and arrange a visit to Robert and Mary’s Place so you can learn more about our program first hand.